Ex-oil tycoon and Russia’s onetime richest man Mikhail Khodorkovsky has been freed from jail after a decade of imprisonment after receiving a pardon from President Vladimir Putin. 19:21 GMT: Despite the former businessman Mikhail Khodorkovsky being flooded with questions during the press conference, some aspects of his past were avoided by the media. Watch RT’s Peter Oliver report. 13:50 GMT: Khodorkovsky, asked to comment on the case of former Ukrainian Prime Minister Yulia Tymoshenko, who is currently in jail on abuse of office charges, expressed hope that the country’s president, Viktor Yanukovich, “will follow the example of President Putin” and free her, granting freedom to “at least one” political prisoner there. “I am not indifferent to this country. Some of my relatives live in Ukraine,” Khodorkovsky said, adding the rider that he does not know much about the current situation in that country. 13:20 GMT: Mikhail Khodorkovsky has said that his family was never dragged into the legal proceedings against him, and that he will bear no grudge against Vladimir Putin. “My family was never affected by the situation, and was treated fairly. And it is this factor that allowed me not to take my conflict with Vladimir Putin too personally. I treat my relationship with Putin pragmatically, without hatred and the desire to take revenge,” he told journalists. 13:18 GMT: Mikhail Khodorkovsky said that media attention was among the factors that helped secure his release. 13:11 GMT: Khodorkovsky has said his “financial situation” allows him not to have to work for money. “My financial situation does not require me to work for the sake of making money,” he said, adding that now he would like to “pay debts” to those who are now in a worse situation. “This is what I would like to do. More specifically, give me more time than 36 hours to think on this issue,” he said. 12:58 GMT: Khodorkovsky has called on people not to politicize the upcoming Olympic Games in Sochi. 12:57 GMT: Khodorkovsky confirmed that he has been issued a one-year Schengen visa. “So, I have a year,” he said, when asked if he would live in Germany. 12:54 GMT: The ex-tycoon has said he had not been thinking about future plans. 12:51 GMT: Mikhail Khodorkovsky has confirmed that he is going to fight for rights of prisoners in Russia. “Don’t consider me a symbol that there are no political prisoners anymore. I will be glad to do everything that depends on me so that there remain no political prisoners,” he said at the press conference in Berlin. 11:50 GMT: Journalists from 83 media outlets from dozens of countries have received accreditation for Mikhail Khodorkovsky’s news conference, which is about to start in Berlin. 11:15 GMT: There exist legal grounds in Russia for imposing restriction on Khodorkovsky's travel, because there is a lawsuit against him demanding half a billion dollars in damages he caused, he said at the closed-door meeting with journalists. 11:10 GMT:“I will not be involved in politics in terms of struggling for political power,” Khodorkovsky told a small group of journalists at the Berlin Wall museum, according to tweets from reporters present. He added that he may do some work to seeking the early release of those he considers political prisoners, whether they are his former Yukos colleagues or otherwise. 07:25 GMT: Khodorkovsky’s decision to appeal for clemency came after he was assured that he would not be required to admit his guilt, he told Dozhd (Rain) TV’s Ksenia Sobchak in an interview from his hotel room in Berlin. Asking for a pardon per se was never an option he rejected, Khodorkovsky said, so when former German Foreign Minister Hans-Dietrich Genscher suggested on November 12 that he could apply for one without an admission of guilt, he did so. When asked about the Yukos case, Khodorkovsky said he had no interest in seeking the return of the company’s assets, but was concerned with the fate of its former employees, such as his business partner Platon Lebedev, who remains in a Russian jail for the same crimes that Khodorkovsky has now been pardoned for. 18:07 GMT: Mikhail Khodorkovsky meets his mother in Berlin. 18:01 GMT: Mikhail Khodorkovsky has met with his parents, who recently arrived in Berlin from Moscow. German Green party spokesperson for East European politics Marieluise Beck has also visited Khodorkovsky at the Hotel Adlon. After talking to Khodorkovsky, Beck said she got the impression that he was not going to return to Russia any time soon. “This issue is not on the agenda now,” she said. 17:42 GMT: Political analyst and expert on Russian-German relations Alexander Rahr was one of the first people to greet Khodorkovsky on German soil. Speaking with RT, he said Khodorkovsky’s face has not changed though he has not seen him for ten years. “I think he did not lose his humor. He is still in a very strong mood. But I don’t think that he is going to be involved in politics – that is my personal opinion. He has a lot to tell – not necessarily about his life in prison – but on his thoughts about the future and the present state of Russia. I think he is seeing himself already as a kind of philosopher, or as a second Solzhenitsyn who has something to say and to whom a lot of people will listen,” Rahr told RT. 17:20 GMT: Mikhail Khodorkovsky's parents arrive in Berlin from Moscow. 16:18 GMT: Evgeniya Albats shared on Facebook earlier on Friday that Khodorkovsky called her after release. She described him as “absolutely stunned and happy”. “Geniya [short from of Evgeniya], Geniya, 10 years…And freedom!” she quoted Khodorkovsky. 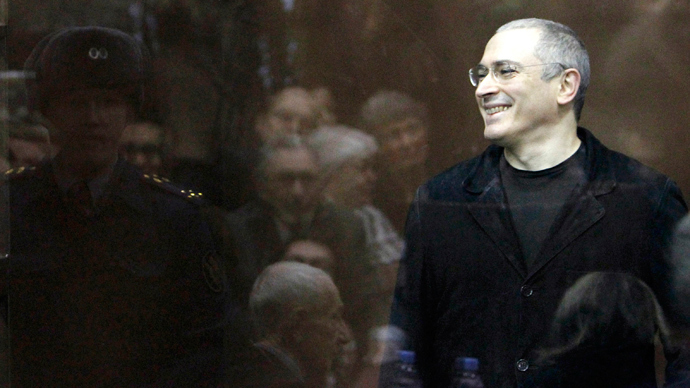 16:06 GMT: Mikhail Khodorkovsky has given his first interview after leaving prison. He has spoken to The New Times magazine’s Albats, who went to Berlin following reports that ex-tycoon was heading there. So far only a minute-long piece has been released on the magazine’s official YouTube channel. Khodorkovsky spoke about the limited possibilities to meet his loved ones while serving his jail term. “I served a year and two months at Krasnokamensk [Siberia] and two-and-a half years here [town of Segezha in Karelia region] – during these years I had long visits. All other time I was on the prison regime and thus had no long visits,” Khodorkovsky said. During those almost four years (of 10 years he spent in prison) he was allowed to meet his relatives in a visiting room “three days, once in quarter”. 14:19 GMT: The Mikhail Khodorkovsky's eldest son talked to the journalists waiting outside the Adlon hotel in Berlin, he said the family has gathered together. Pavel Khodorkovsky has thanked everybody who supported his father, and invited the reporters to Mikhail Khodorkovsky’s press-conference on Sunday. 13:12 GMT: A photo of Mikhail Khodorkovsky in Berlin is posted on Instagram by the editor-in-chief of The New Times magazine, Evgeniya Albats. 13:07 GMT: RT's Peter Oliver reports the latest from outside the Adlon Hotel in Berlin. 12:38 GMT: The parents of Mikhail Khodorkovsky said they aren’t bringing any presents to Germany, as they had to prepare for the trip in a rush. The main thing for Khodorkovsky now is to buy new clothes as his still dressed in the clothes he used to wear in prison, his mother, Marina Khodorkovskaya, told LifeNews. Marina Khodorkovskaya also said that she was “totally against” her son turning to politics after being released from prison. According to LifeNews, Khodorkovsky’s parents are now at a Moscow airport, checking in for their flight, while reports in German media claim that Marina and Boris are already in Berlin. 12:18 GMT: Mikhail Khodorkovsky, who arrived in Berlin in a private Cessna jet belonging to OBO Betterman late Friday, won’t have to pay for his flight, says the representative of the German company. “It was a humanitarian act asked for by former German FM Hans-Dietrich Genscher,” he said. 10:54 GMT: Mikhail Khodorkovsky will hold a press conference in Berlin at 13:00 local time (12:00 GMT) on Sunday December 22, a representative of the ex-Yukos CEO announced. 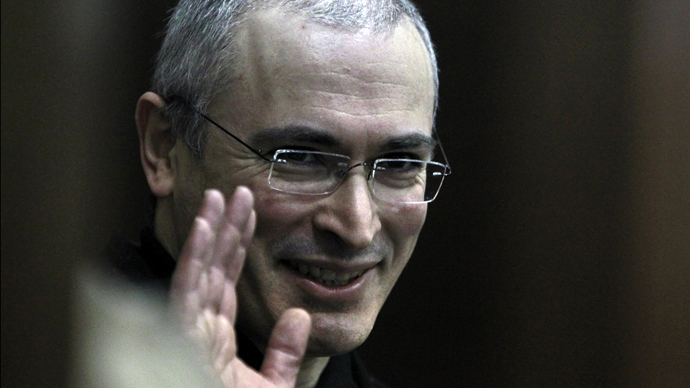 Khodorkovsky is reportedly planning to share his plans for the future. The media briefing will take place at the Berlin Wall Museum. 10:49 GMT: Khodorkovsky, who arrived in Germany late Friday, "is free to return to Russia," Putin's spokesman Dmitry Peskov told AFP. However, Peskov declined to comment on whether any conditions are attached to the release of the former oil tycoon or whether he would be free to participate in politics. Peskov also revealed that Khodorkovsky wrote two letters to Putin: a short legal letter, and a longer, more personal one. Khodorkovsky said he had made the pardon request to Putin on November 12, for family reasons. 21:57 GMT: Mikhail Khodorkovsky is planning to hold a press conference on December 22, political analyst Alexander Rahr told Voice of America after meeting him in Germany. German Foreign Minister Hans-Dietrich Genscher, who played a significant role in negotiating Khodorkovsky’s release, will talk to the press the day before, according to Rahr. 20:37 GMT: Khodorkovsky’s mother and son are planning to meet him “as soon as possible.” Marina Khodorkovskaya told RT Friday evening they were purchasing purchasing plane tickets to Berlin. 19:11 GMT: The United States said Friday that it “welcomes” the Kremlin’s decision to pardon former oil tycoon Mikhail Khodorkovsky and other Russian prisoners but expressed concern about the mingling of politics and justice in Russia. 18:10 GMT: Journalists are surrounding the main entrance of Adlon Hotel in central Berlin, where freed Mikhail Khodorkovsky is suspected to have stopped after arriving to Germany’s capital. Watch LIVE. 17:48 GMT: Germany’s government has issued a statement saying that Chancellor Angela Merkel has welcomed Khodorkovsky’s release. “The Chancellor welcomes Mikhail Khodorkovsky’s release from custody,” the government spokesman, Steffen Seibert, announced. 17:40 GMT: Former FM Genscher described the move as "significant and very encouraging". 17:19 GMT: Mikhail Khodorkovsky is going to stay in Berlin for some time after being released from prison, the former oil tycoon’s spokesman, Olga Pispanen, told RT. His wife and children are going to fly to the German capital in the next few days, she added. “We don’t know anything about his specific plans, besides that he wants to stay with his family and spend holiday with them,” Pispanen said. It’s not yet clear if Khodorkovky will celebrate the New Year in Berlin or choose another location as “he’s a free man now and has the right to spend holidays wherever he wants and not answer to anybody,” she stressed. As for his future occupation, “Mikhail Borisovich has been speaking about this many times – in many interviews – that he’s going to be involved in public activities. It’s no secret,” Pispanen said. 17:01 GMT: RT’s Peter Oliver reports from Berlin that there is speculation that Khodorkovsky might have stopped at the Adlon Hotel, an upmarket establishment in central Berlin. 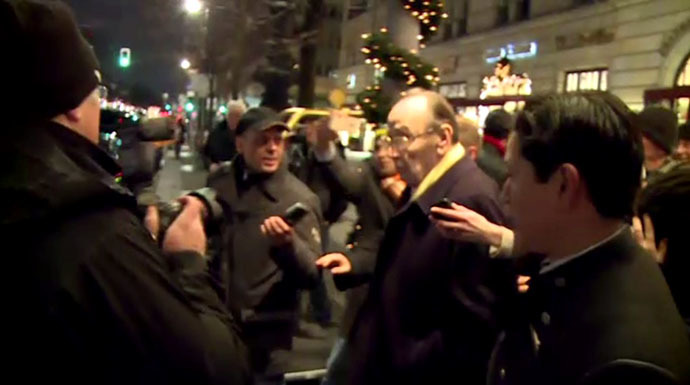 Hans-Dietrich Genscher has been seen leaving the hotel. 16:22 GMT: Khodorkovsky has given special thanks to Genscher “for his personal participation in my fate,” he wrote in the statement which has been published on Khodorkovsky’s press-secretary's Facebook page, as well as the Facebook page of Khodorkovsky & Lebedev Communications Center. #Khodorkovsky convey protected by police leaves airport. Apparently received 1 year visa at airport. 15:21 GMT: According to German DPA news agency Genscher asked the German company OBO Betterman to provide an airplane. According to Mikhail Khodorkovsky's lawyer Anton Drel, who is with his client at the moment, a statement will be issued very soon. 15:10 GMT: Former German foreign minister Hans-Dietrich Genscher has confirmed that Khodorkovsky arrived on a private jet to Berlin and that he personally picked him up at the airport. 14:40 GMT: Mikhail Khodorkovsky has landed in Berlin, German foreign office spokesman has said in a statement. 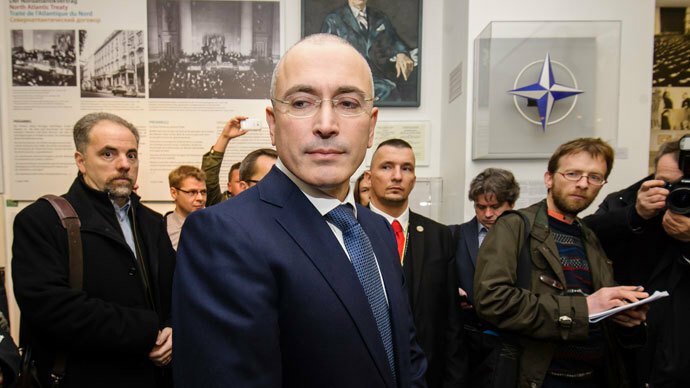 14:08 GMT: Russia’s embassy in Berlin has said it has no information regarding Khodorkovsky’s departure to Germany, the embassy told Itar-Tass. 13:55 GMT: Khodorkovsky's former business partner Platon Lebedev has said he was very glad to hear the news about his release, Lebedev’s lawyer Aleksey Miroshnichenko said. “[Lebedev] has not said anything on his own possible appeal to President Vladimir Putin for a pardon,” the lawyer said. 13:43 GMT: The CEO of Russian oil giant Rosneft, Igor Sechin, has said he sees no threat of potential legal action from Khodorkovsky after his release, Itar-Tass news agency reported. Sechin has said Rosneft is ready to consider giving Khodorkovsky a job, but he should be qualified. Sechin said that all “senior management positions are occupied,” RIA Novosti reported. 13:14 GMT: RT talked to Mikhail Khodorkovsky’s mother, who has denied media reports, which said that she is “undergoing medical treatment” in Germany, where her son flew. 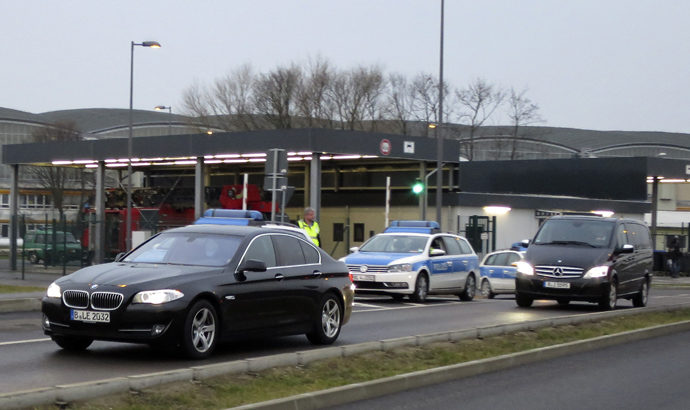 12:10 GMT: Mikhail Khodorkovsky has flown to Germany, the Federal Penitentiary Service (FSIN) has said in a statement. 10:49 GMT: Mikhail Khodorkovsky lawyer Vadim Klyuvgant has announced that his client has left the prison in the Karelia Region town of Segezha, nearly 1,000 kilometers north of Moscow. “We have just received official confirmation from the management of the prison that Mikhail Khodorkovsky has been released and has left the prison,” he said. 09:01 GMT: Russia’s President Putin signed a decree pardoning Mikhail Khodorkovsky. "Guided by humanitarian principles, I decree that Mikhail Borisovich Khodorkovsky... should be pardoned and freed from any further punishment in the form of imprisonment. This decree comes into force from the day of its signing," the decree, published on the Kremlin website on Friday, read.